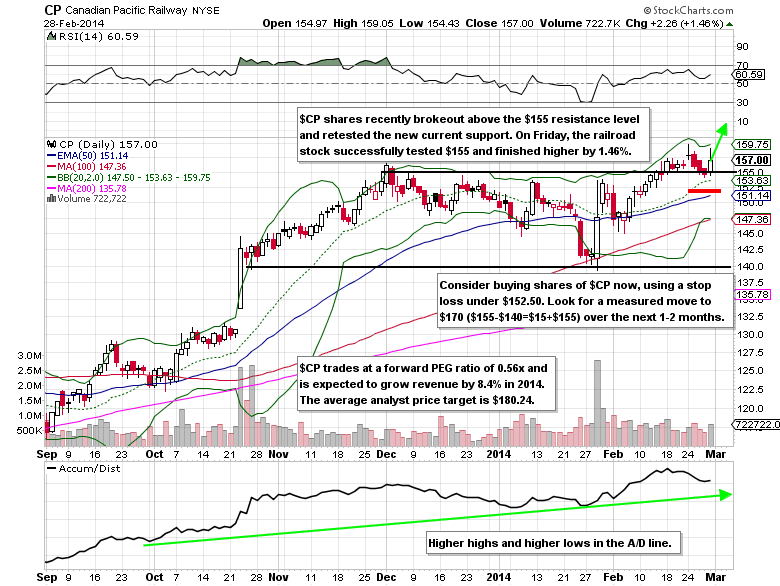 Notes: Canadian Pacific Railways (CP) shares go ex-dividend on Wednesday, March 26th. The $0.315 dividend will be payable on Monday, April 28th. (CP) is set to announce Q1 earnings in late April. Updates: Medtronic (MDT) shares rose 1.65% on above average volume on Friday. We remain long the May 2014 $60 calls. Free Trial: If you would like to know more about premium content or you would like a free trial of our service, email me at Mitchell@OptionsRiskManagement.com . Premium Subscription: Join now to gain access to the all of the stock watchlist updates (30-50 stock and option trade ideas like the one above every week), unusual options activity reports, earnings trade ideas, weekend market updates, Premium Twitter feed, and more! All for just $29.95/month or save by purchasing an annual subscription. Join me and the other ORM traders in the chat room today!